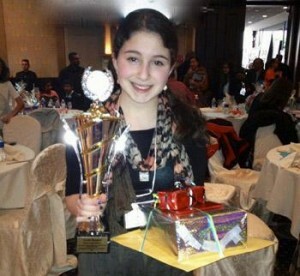 700 people attended the recently held event in Toronto where the winners were announced. This effort demonstrated to children in Canada how they can help children in Israel. This of 5 to 19 to create works of art depicting “A Memorable Moment”, “A Beautiful Place” or “A Dazzling Dream”. 13,000 children from summer camps and schools from across Canada submitted paintings and drawings. 25 winners were selected by an independent panel of judges, and will have their art hung in the 25 new rooms in the Children’s Chronic Respiratory Care Department now being constructed in the new Samson Pavilion at Herzog Hospital. In addition, 152 pictures were selected and will hang in hospitals, nursing homes and shelters across Canada. Awareness Campaign has also projected the work of Herzog Hospital in communities throughout Canada, which have never heard of Herzog before. All of us in Israel, especially the children and staff in the Children’s Chronic Respiratory Care Department compliment and thank all those involved in this wonderful initiative. For more information, visit the new Canadian Friends website, www.herzoghospital.ca.